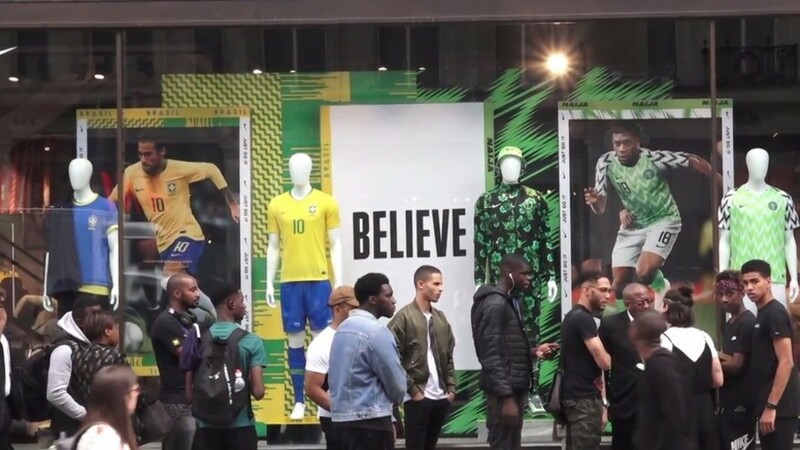 Nigeria’s ultra-popular World Cup 2018 shirt sold out within minutes of going on sale on Friday, with football fans queuing round the block to get their hands on the Super Eagles strip. The kit has caused shockwaves in the footballing world, with its traditional emerald shirt colour filtered with white, all arranged in a collage of mini chevrons. Shirt maker Nike received a staggering 3 million orders for the shirts before they even hit the shops, generating an incredible $255 million in profits for the company. That figure is more than football giants Manchester United sold for the entire year of 2016. When the shirt was finally released, fans were snapped in London center queuing quite literally around the corner to grab their own jersey, with just two weeks until the World Cup begins in Moscow. The chic shirt has managed to transcend football and cross over into the world of fashion, making the pages of gentleman’s lifestyle magazine Esquire, which described it as: “A staggered zig zag design is as cool on the pitch as it is off it.... It's very good, is what we're basically saying. Fans can catch a glimpse of the kit at Russia 2018 when Nigeria play their first game against Croatia at Kaliningrad Stadium on June 16. The suited and booted side were drawn in Group D alongside the Balkan nation, Iceland and old World Cup foes Argentina. Hosts Russia take on Saudi Arabia at Luzhniki Stadium in Moscow on June 14. The tournament runs through to the final game on July 15 at the same venue.